Endoscopic transpapillary pernasal gallbladder drainage and endoscopicgallbladder stenting (EGS) have recently been reported to be useful inpatients with acute cholecystitis for whom a percutaneous approach iscontraindicated. The aim of this study was to evaluate the efficacy ofpermanent EGS for management of acute cholecystitis in elderly patients whowere poor surgical candidates. We retrospectively studied 46 elderly patients aged 65 years or older withacute cholecystitis who were treated at Japan Labour Health and WelfareOrganization Niigata Rosai Hospital. In 40 patients, acute cholecystitis wasdiagnosed by transabdominal ultrasonography and computed tomography, while 6patients were transferred from other hospitals after primary management ofacute cholecystitis. All patients underwent EGS, with a 7Fr double pig-tailstent being inserted into the gallbladder. If EGS failed, percutaneoustranshepatic gallbladder drainage or percutaneous transhepatic gallbladderaspiration was subsequently performed. The main outcome measure of thisstudy was the efficacy of EGS. Permanent EGS was successful in 31 patients (77.5%) with acute cholecystitis,without any immediate postprocedural complications such as pancreatitis,bleeding, perforation, or cholangitis. The most common comorbidities ofthese patients were cerebral infarction (n=14) and dementia (n=13). In 30 ofthese 31 patients (96.7%), there was no recurrence of cholecystitis and 29patients (93.5%) remained asymptomatic until death or the end of the studyperiod (after 1 month to 5 years). EGS can be effective for elderly patients with acute cholecystitis who arepoor surgical candidates and can provide a solution for several years. Acute calculous cholecystitis appears to arise from obstruction of the cystic duct orthe junction between the gallbladder and cystic duct by a stone or edema resultingfrom local mucosal erosion and inflammation caused by a stone . Early cholecystectomy is the standard therapy for acute cholecystitis [1, 2]. Although cholecystectomy is generally safe, its mortality rate increasesmarkedly in high-risk patients with comorbidities [3, 4]. In critically ill elderly patients, the mortality rate of emergencycholecystectomy can be as high as 30% [3, 4]. Therefore, as a temporary measure, high-risk patients are treated bydecompression of the gallbladder using percutaneous transhepatic gallbladderdrainage (PTGBD) or percutaneous transhepatic gallbladder aspiration (PTGBA) [5–8]. In addition, several authors have reported that endoscopictranspapillary naso-gallbladder drainage (ETGBD) is a safe and effective procedurefor acute cholecystitis [9–12]. Endoscopic gallbladder stenting (EGS) may not only be effective foracute cholecystitis, but could also be a viable strategy for long-term management ofsymptomatic cholelithiasis in patients who are poor surgical candidates [13–24]. However, very few studies have provided detailed long-term follow upanalysis of EGS. Here, we report our experience with various EGS techniques for the management ofacute cholecystitis and evaluate the efficacy of permanent stenting as an option inelderly patients who are poor surgical candidates. The study population consisted of 46 patients with acute cholecystitis who were 65years of age or older. They were admitted to Japan Labour Health and WelfareOrganization Niigata Rosai Hospital between 2007 and 2012. In 40 patients, acutecholecystitis was diagnosed by transabdominal ultrasonography (US) and computedtomography (CT) at our hospital, while 6 patients were transferred from otherhospitals after primary management of acute cholecystitis. After endoscopicretrograde cholangiography (ERC), EGS was attempted in all 46 patients. ERC was performed with a video duodenoscope (JF-260V; Olympus Medical Systems, Tokyo,Japan). Cannulation of the bile duct and cystic duct was done with an over-the-wireendoscopic retrograde cholangiopancreatography (ERCP) cannula (Tandem XL; BostonScientific, Tokyo, Japan) and an 0.018, 0.025, or 0.035 inch guidewire (Radifocus;Terumo Tokyo, Japan or Chiarida; Century Medical Ink, Tokyo, Japan). The guidewirewas advanced retrogradely through the cannula and coiled within the gallbladder.Over this wire, a 7Fr double pig-tail stent (10 or 15 cm, Olympus) was advanced intothe gallbladder (Additional file 1). Clinical success with EGS was defined as complete resolution of symptoms, improvementof laboratory data (white blood cell count and C-reactive protein), and improvementof US findings. Follow-up of permanent EGS patients was performed until death or theend of the study period, with review of symptoms and laboratory data every 3 monthsplus US every 6 months. Written informed consent was obtained from the patients (or from a family member ifthe patient had cerebral infarction or dementia) and the ethics committee of JapanLabour Health and Welfare Organization Niigata Rosai Hospital approved this study.We obtained consent for publication of all material in this article, including theindividual information contained in the tables. The characteristics of the 46 subjects are depicted in Table 1. Their average age was 79.70±7.96 years (mean ± standarddeviation [SD]). Twenty-four patients also had choledocholithiasis, and we performedendoscopic sphincterotomy (EST) in 34 patients, including 10 withoutcholedocholithiasis to obtain adequate post-EGS flow in the common bile duct.Emergency EGS was successful in 31 out of 40 patients (77.5%) with acutecholecystitis. We also performed elective EGS for the purpose of permanent placementin 6 patients. We inserted a 10 cm double pig-tail stent in 7 patients and a 15 cmdouble pigtail stent in 30 patients. There were no immediate postproceduralcomplications, such as pancreatitis, bleeding, perforation, or cholangitis. EGS = endoscopic gallbladder stenting. We performed emergency EGS in 40 patients who presented with acute severecholecystitis and were poor candidates for cholecystectomy. In 31 patients (77.5%),emergency EGS was successful and the procedural time was 27.6 ± 15.1 min (mean± SD). Clinical success was achieved within 3 days in all 31 patients. Theirsymptoms (abdominal pain, fever, and vomiting) resolved and they started to eat fromthe day after emergency EGS, and all 31 showed normalization of WBC and a decreaseof C-reactive protein after 3 days. All were discharged from hospital within 1 week.We administered antibiotics to all 31patients for 3 days after emergency EGS, butthey did not need ICU support, intubation, or inotropes. Among the 31 successfulpatients, we used a microcatheter for EGS in 4 difficult cases. The reasons fordifficulty were severe stricture and kinking of the cystic duct and we accomplishedEGS in these cases by using an 0.018 inch guidewire and a microcatheter (Additionalfile 2). The microcatheter had an inner diameter of 0.59mm, outer diameter of 0.89 mm, and an effective length of 2,600 mm (Figure 1). Of the 31 patients, 6 patients underwent cholecystectomywithin 2 months of EGS, while 25 patients were followed up without surgery due totheir poor general condition (Figure 2). The structure of the microcatheter used for endoscopic gallbladderstenting. Among the 40 patients in whom emergency EGS was attempted, it failed in 9 patientsbecause the cystic duct branched caudally from the common bile duct (n=3), becausethere was severe kinking of the cystic duct (n=3), because the cystic duct wascompletely blocked by stones (n=2), or because of cystic duct adhesions (n=1). Amongthe 9 patients in whom EGS failed, we performed PTGBD in 6 patients and repeatedPTGBA in 3 patients. Of the 6 patients receiving PTGBD, 5 underwent cholecystectomywithin 2 months, while 1 patient died of aspiration pneumonia after 1 month. The 3patients receiving repeated PTGBA were discharged from hospital after 2 or 3weeks. We also performed elective EGS for the purpose of permanent placement in 6 patients(5 after PTGBD and 1 after conservative treatment) who were transferred from otherhospitals within 1 week after the onset of acute cholecystitis, and the procedurewassuccessful in all 6 patients. In 5 patients, EGS was done by passing the guidewireantegradely into the duodenum via the PTGBD route and then the guidewire was usedretrogradely (Figure 3). In 1 patient, EGS was done viaperoral cholangioscopy (POCS) with a GIF-XP260 (Olympus) because the cystic ductbranched caudally from the common bile duct and this was considered to be a verydifficult case for EGS. The procedure was started by inserting the GIF-XP260 intothe common bile duct after endoscopic sphincterotomy. We endoscopically explored thecystic duct and then easily inserted the guidewire and the cannula into the duct.Then the guidewire was advanced retrogradely through the cannula and coiled withinthe gallbladder. Afterwards, we exchanged the GIF-XP260 for the GIF-Q260, and adouble pigtail stent was advanced into the gallbladder over the wire (Additionalfile 3). 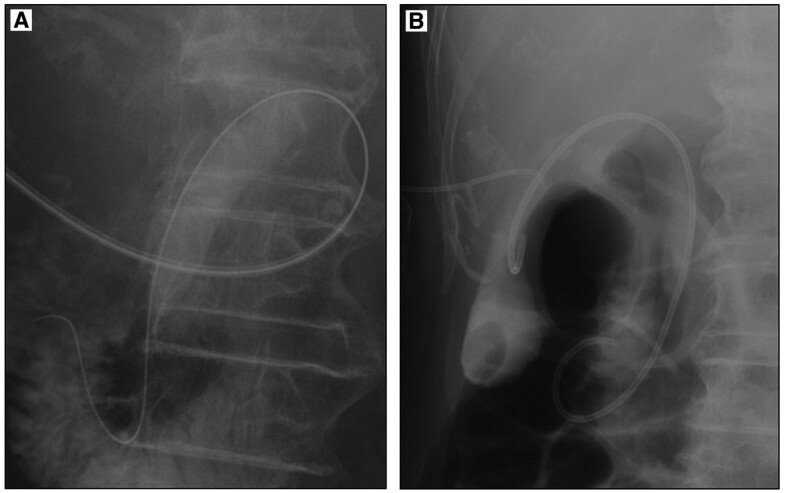 A guidewire has been passed antegradely into the duodenum via the PTGBDroute (A), and EGS was performed by using the guidewire retrogradely(B). 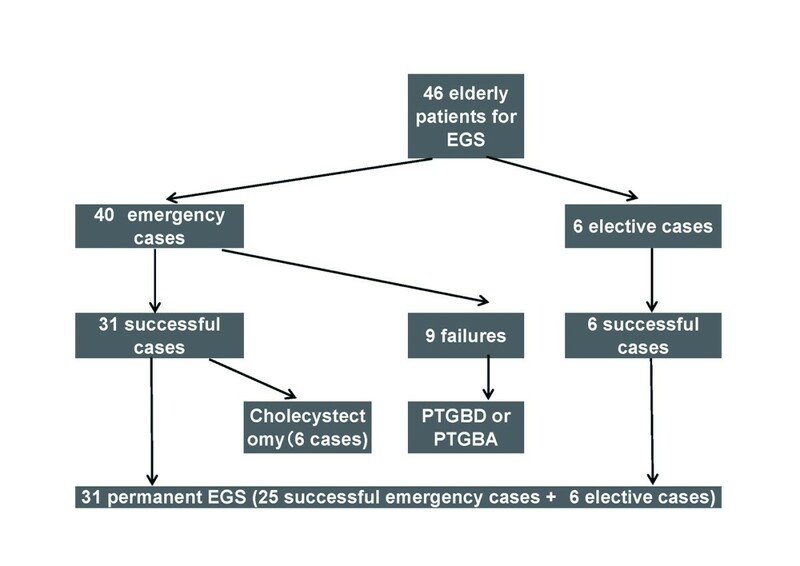 Permanent EGS was useful for prevention of cholecystitis in 31 elderly patients whowere poor surgical candidates. Their clinical characteristics and outcomes arelisted in Table 2. The average age of the patients was82.19 ± 7.15 years (mean ± SD). Sequelae of cerebral infarction werepresent in 14 patients, dementia in 13 patients, severe heart disease in 1 patient,cerebral hemorrhage in 1 patient, malignant mesothelioma in 1 patient, andpolymyalgia rheumatica in 1 patient. The follow-up period ranged from 1 month to 5years. In 30 of 31patients (96.7%), there was no recurrence of cholecystitis and 29patients (93.5%) remained asymptomatic for 1 month to 5 years (until death or theend of the study period). Sixteen patients (51.6%) died from 1 month to 5 yearsafter the procedure due to aspiration pneumonia, heart failure, cerebral infarction,gastric cancer, or malignant mesothelioma. Two patients developed latecomplications. Patient no. 3 developed vomiting at 2 months and 8 months after EGS.We diagnosed her as acute cholecystitis from the US and CT findings (occlusion at 2months and migration at 8 months). After the stent was exchanged with ERC, thesymptoms soon resolved. Following the second exchange, there have been no furthercomplications. Patient no. 5 underwent removal of the gallbladder stent at 3.5 yearsafter EGS because he developed a liver abscess (without cholecystitis). He wastreated with antibiotics and the abscess resolved after 2 months. We did notreinsert a gallbladder stent because the patient refused it. Although scheduledstent exchange was not done, the other 29 patients (93.5%) did not have any latecomplications. The definitive treatment for acute cholecystitis is cholecystectomy [1, 2], but in critically ill elderly patients, the mortality rate of emergencycholecystectomy can reach 30% [3, 4]. Several authors have described the usefulness of PTGBD or PTGBA for suchpoor surgical candidates [5–8]. However, we sometimes encounter patients who cannot tolerate thepercutaneous transhepatic approach (e.g., because of anticoagulant/antiplatelettherapy, disseminated intravascular coagulation, gallbladder malposition, or severecontracture). Such patients are likely to develop intra-abdominal bleeding, bilomaor even biliary peritonitis, if these procedures are performed. Recently, ETGBD hasbeen reported as an alternative to PTGBD or PTGBA [9–12]. Although it is possible to wash the gallbladder via an ETGBD tube, thereis a danger of the tube being pulled out by elderly patients and it cannot be leftin the gallbladder over the long-term. Otherwise EGS could be a viable strategy for long-term management of symptomaticcholelithiasis in patients who are poor surgical candidates. EGS has been shown tobe an effective long-term option in cirrhosis patients with cholelithiasis as abridge to liver transplantation [13–17]. Studies on EGS have demonstrated a favorable clinical outcome up to 3years after stenting without any need for routine replacement of the stent [14, 15]. In a prospective follow-up study, Lee et al. also showed that at least 80% of 20 patients undergoing EGS maintainstent patency without requiring stent exchange for at least 2 years. In the presentseries, we performed permanent EGS in 31 elderly patients. As a result, 30 patients(96.7%) had no recurrence of cholecystitis and 29 patients (93.5%) remainedasymptomatic for the duration of their survival. There were no late complications in14 patients after follow up for more than 3 years, 9 patients after follow up formore than 4 years, and 1 patient after follow up for more than 5 years. Accordingly,this study has demonstrated the longest good clinical outcome for up to 5 yearsafter EGS in comparison with earlier studies without routine stent replacement [10, 12]. Stents are thought to protect against recurrent cholecystitis byoccupying the lumen of the cystic duct, thereby preventing stone impaction . It has also been postulated that after probable occlusion of the stent,adequate flow of bile from the gallbladder to the duodenum still occurs along theouter surface of the stent through capillary action, a phenomenon known as“wicking” . Moreover, the stent may prevent bile flow from the common hepatic ductinto the cystic duct. In our series, we found that the gallbladders of 12 patientsbecame very small. Only 2 patients developed late complications. One patient (Patient no. 3) had 2episodes of recurrent cholecystitis at 2 months and 8 months after EGS (stentocclusion at 2 months and stent migration at 8 months). When occlusion occurred at 2months, we thought that the probable cause was placing the stent without washingsludge out of the gallbladder with saline. After that, we had no recurrentcholecystitis due to occlusion of stents because we washed the gallbladder severaltimes with 20 mL of sterile saline when EGS was performed. Stent migration at 8months was caused by strong intestinal peristalsis, so we inserted the next stent asfar as the fundus of the gallbladder because the previous stent had only reached theneck of the gallbladder. Subsequently, none of the stents have fallen out. We thinkthat it is important to insert the stent as far as the fundus of the gallbladder andwash the gallbladder several times with sterile saline when EGS is performed toprevent stent migration and occlusion. In 1 patient (Patient no. 5), the stent wasremoved at 3.5 years after EGS because of a liver abscess without cholecystitis. Themajor cause of liver abscess may have been inadequate flow in the common bile ductbecause EST was not performed since that patient was on antiplatelet therapy. Werecommend performing EST if possible and opening the stent side holes if that isimpossible to obtain adequate flow in the common bile duct after EGS. In 1984, Kozarek  introduced endoscopic transpapillary cannulation of the gallbladder.Subsequently, new catheters and guidewires have been developed to facilitateselective cannulation of the cystic duct and gallbladder [10, 12, 20, 25]. Several other authors have attempted EGS and ETGBD in patients withacute cholecystitis [9–25]. The most recent evidenced-based report on ETGBD by Hirota et al.recommends it as an option for gallbladder drainage . Clinical success was achieved in all 31 patients (100%) with acutecholecystitis by performing EGS within 3 days. Moreover, after successful emergencyEGS, patients were discharged from hospital within 1 week. Thus, EGS may shorten theduration of hospitalization compared with PTGBD or ETGBD. We consider that EGS and ETGBD are best indicated for patients with acutecholecystitis in whom transhepatic route cannot be used. Ferritis et al. , Toyota et al. , Kjaer et al. , and Itoi et al. reported ETGBD success rates of 89% (16/18), 82% (18/22), 70.6% (24/34),and 83.7% (38/43) in smaller series. Our success rate for emergency EGS was 77.5%(31/40), which is similar to the success rate for ETGBD. We believe that EGS isslightly more difficult than ETGBD because the stent is harder to manipulatecompared with an ETGBD tube (a 5Fr soft drain tube is often used for ETGBD). Weencountered 3 cases in which we could not place a stent in the gallbladder despiteinserting the guidewire, because of cystic duct occlusion by stones in 2 cases andsevere kinking of the cystic duct in 1 case. Moreover, emergency EGS for acutecholecystitis is more difficult than elective EGS because the cystic duct oftenshows stricture or obstruction in acute patients. In our series, the success rate ofemergency EGS was 77.5% (31/40) and this was lower than that of elective EGS (100%,6/6). EGS has not become very popular so far. The main reason is difficulty in negotiatingthe cystic duct and gallbladder with the guide wire. We used microcatheters for 4difficult patients, and used POCS for 1 patient. The microcatheters used in 4 caseswere designed for abdominal angiography and were adapted to the EGS procedure. Afterthe microcatheter and 0.018 inch guidewire were advanced through the ERCP cannula,we could pass severe strictures and kinks of the cystic duct in all 4 cases. Thus, amicrocatheter is useful for contrast studies of the cystic duct and for crossingstrictures and kinks, but more highly visible and softer microcatheters should bedeveloped. Barkay et al. reported successful cannulation of the cystic duct by visualization withthe SpyGlass cholangiopancreatography system (SpyGlass Direct Visualization System;Microvasive Endoscopy, Boston Scientific, Natick, MA) with EGS in a patient withcystic duct obstruction and acute cholecystitis. In 1 of our patients, a novel EGStechnique using POCS was tried. POCS enabled us to endoscopically explore the cysticduct and easily insert the guidewire into the duct by using the angulation androtation of the GIF-XP260. In our opinion, use of a microcatheter and POCS couldincrease the technical success rate of EGS. Our study showed that EGS can be effective for elderly patients with acutecholecystitis who are poor surgical candidates. Generally, EGS is associated with ahigher risk of aspiration pneumonia in comparison with PTGBA because EGS isperformed by peroral endoscopy. EGS should be performed as rapidly as possible andimprovement of EGS technology is needed in the future. We conclude that EGS can be effective for elderly patients with acute cholecystitiswho are poor surgical candidates and the stent can be left for many months toseveral years. However, further investigations will be needed to establish theappropriate role of EGS. The authors declared that they haved no competing interests. SM, YA, and MO contributed to research design. SM, RN, TM, MO, and YA collected thedata. SM drafted the manuscript. MH, RN, TM, YA, and MO contributed to revising themanuscript. All authors approved the final version.